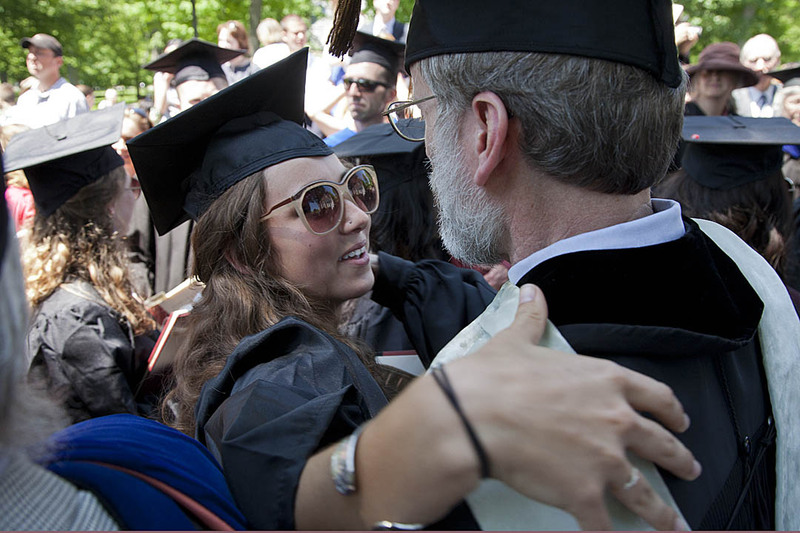 Bonnie Bassler (left) is congratulated by Robert De Niro (second from left) after her address at Commencement. Gwen Ifill (second from right) and interim President Nancy Cable add their applause. Photograph by Phyllis Graber Jensen/Bates College. 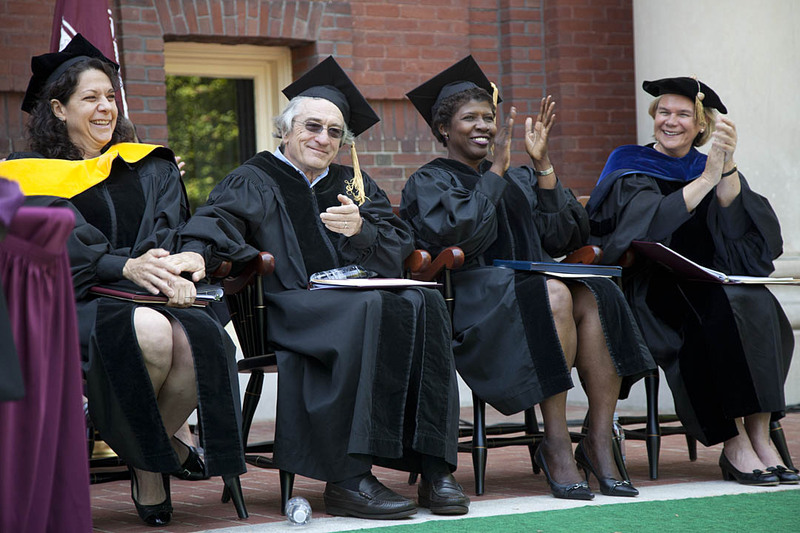 As you might expect from one of the nation’s leading journalists, the advice that Gwen Ifill gave to the Bates College class of 2012 was short and to the point: Look up. Ifill was one of three prominent figures to receive an honorary degree and to offer remarks to the 463 Bates graduates on May 27, joining Princeton biologist Bonnie Bassler and actor Robert De Niro. Thanks to the honorands’ edgy wit, energy and well-researched references to insider Bates lore like the Blue Goose and Midnight Madness, Bates enjoyed an unusual college graduation: one that sent the graduates away with not just an earful of good advice, but stomach muscles sore from laughing. One estimate had the crowd at 5,000, and with families, faculty and friends filling the Historic Quad under blue skies, interim President Nancy Cable offered welcoming remarks. “You have given us your good will, your creativity, your humane instinct, your artistic and athletic gifts, your willingness to ask the right set of questions, your sense of reason and your dogged determination to sustain the momentum at the college,” Cable said. Cable also called for a moment of silence to honor the memories of two individuals the college community lost too soon — economist David Aschauer, who died last August, and first-year student Evan Dube, who passed away May 19 during a Short Term trip to the Shetland Islands. Bassler’s doctorate of science recognizes her transformational research into bacterial “quorum sensing,” the ability of bacteria to coordinate their behavior through chemical signaling. 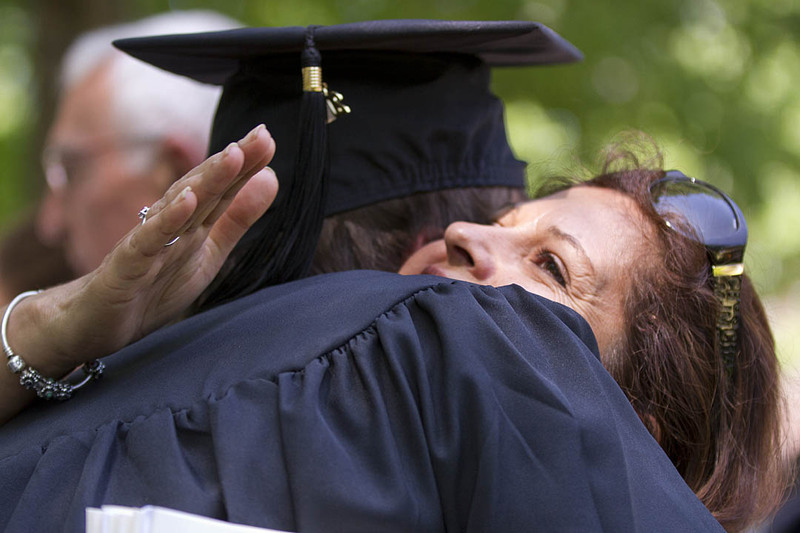 Hilarious from the outset — “Now, enough about you,” she told the graduates. “Let’s please talk about me” — she opened her talk with the conceit that the one scientist among the honorands would never have the prestige of a famous actor and a television journalist. 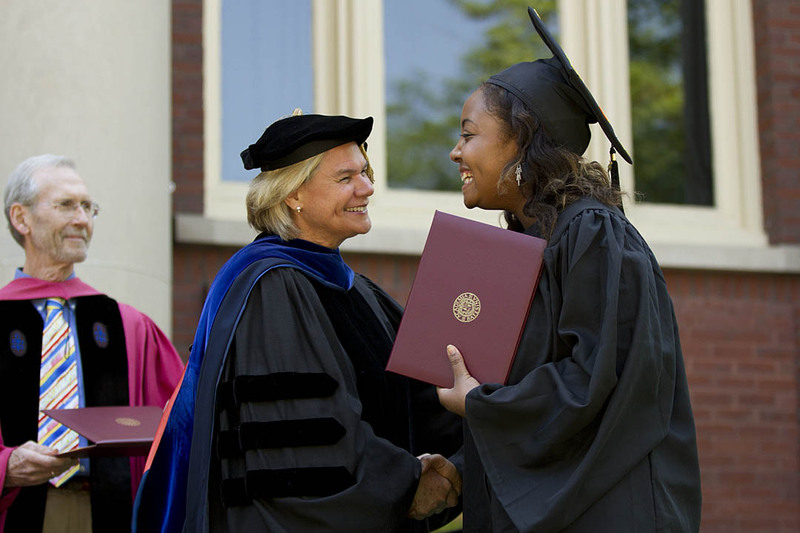 But Bassler artfully steered her address toward the graduation speaker’s prime responsibility, that of sending the graduates off with solid advice. When she was their age, she told the graduates, she believed there were the De Niros and Ifills of the world, and then there was everybody else, including the Bonnie Basslers. Now she knows better. De Niro had his own subversive way of commenting on the star power that he and Ifill brought to Bates. For instance, he offered this helpful advice: become a movie star. “There may be pressure on you to change the world, but you must find the strength to resist,” he said. “When I started, I wasn’t a movie star, and it sucked. The moment I became a movie star, things started to get better. “When you’re a movie star, you can coast. For example, who remembers the last really good successful picture I made?” De Niro asked, to huge laughs. De Niro took on the college world, too, pointing out that by dropping out of high school in the 1960s, he saved $6,000 in tuition costs. “I feel a little foolish, because if I had waited until now not to go to college, I could have saved around a quarter of a million. “But I was in a hurry and, you know, it worked out just fine. 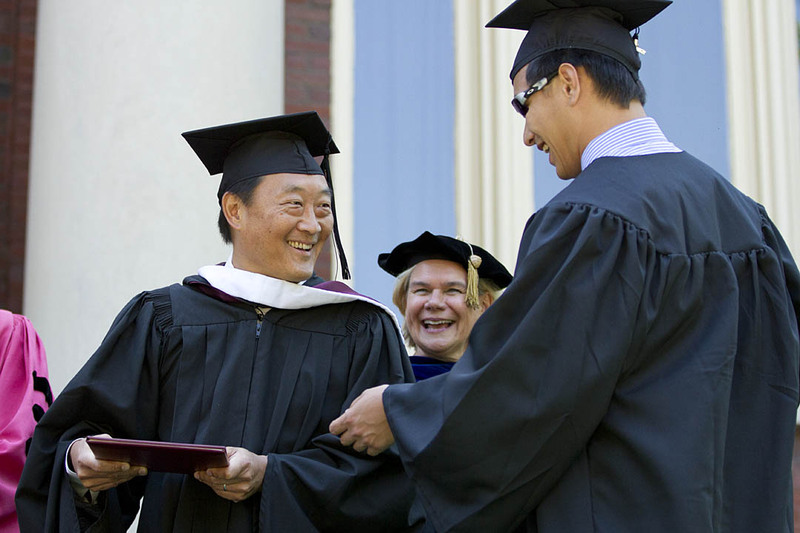 I saved the money and I got the degree” — the doctorate of fine arts he had just gotten from Bates. But she played it mostly straight. “Now there are some benefits to be had in looking down,” she said. 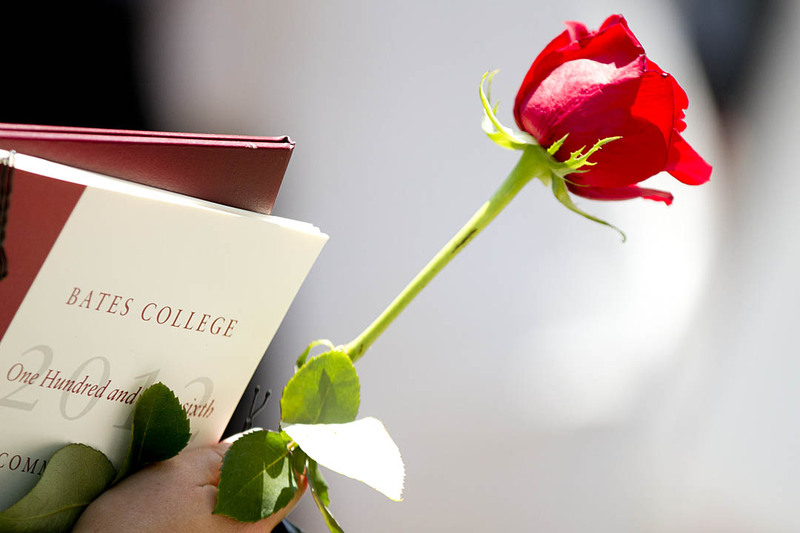 “If you look down today you will be able to follow in the footsteps of Bates graduates like Ed Muskie and Benjamin Mays and Peter Gomes and Bryant Gumbel. That ain’t half bad. Thanks to the honorand addresses, as well as weather that couldn’t have been better, it was an ecstatic throng that watched the graduates collect their diplomas. Hannah Zweifler of West Hartford, Conn., was the last, and Cable held Zweifler’s hand high in victory. Alumni Council President Roland Davis ’92 welcomed the new grads to the ranks of the Alumni Association. And Multifaith Chaplain Bill Blaine-Wallace sent the class of 2012 on its way with a benediction that he based on an incident when Southern author Flannery O’Connor declined to meet African American author James Baldwin for fear it would cause the “greatest trouble and disturbance and disunion” in her Georgia town.